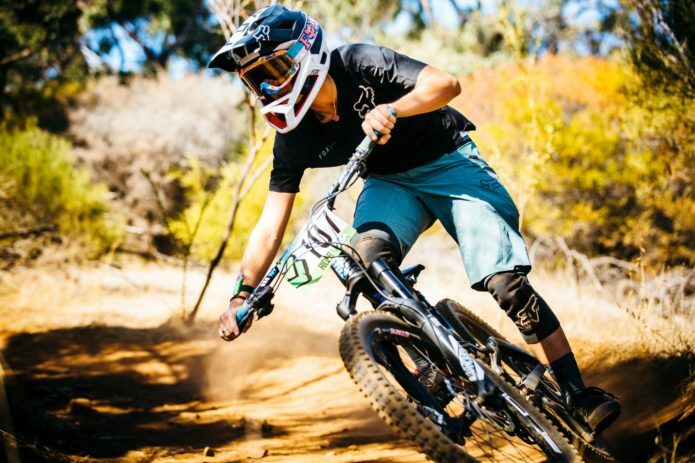 Earlier this week the Australian National DH team was announced and Kona Gravity team rider Connor Fearon made the list along with teammates Josh Button and Tegan Molloy. You may be wondering what Connor’s been up to recently and may have noticed his absence from the World Cup in Mont Sainte Anne. “Alright, so way back at Andorra World Cup I crashed 3 corners from the finish in my race run. For the next few days my hand was pretty swollen and sore from the crash but I could still ride and thought whatever was wrong would heal. After 3 weeks of it really slowly getting better I got x-rays to see if anything was broken. Turns out my little finger was pretty much broken in half and I had to get a little surgery to put wires into my finger to keep it straight. This really sucked because it would mean I miss out on MSA and Val di Sole. These are the first and second World Cup I’ve ever missed since starting in 2011 (42 World Cup starts). “Unfortunately, this is disappointing for Connor, but it’s part of every pro athlete’s career at some point to have to step down from a couple events to get better. Thankfully, he will be OK for the World Championships in Cairns, in his home country of Australia. He’s been looking forward to this particular race for the last couple of years. So there you have it: an update from Connor, a particularly gnarly x-ray image, and a plan for what is arguably Connor’s biggest race of the year, the World Championships in Cairns. We look forward to watching Connor and fellow Australians Josh and Tegan represent on home turf!